Synchrony Financing - must be applied for in-store only. 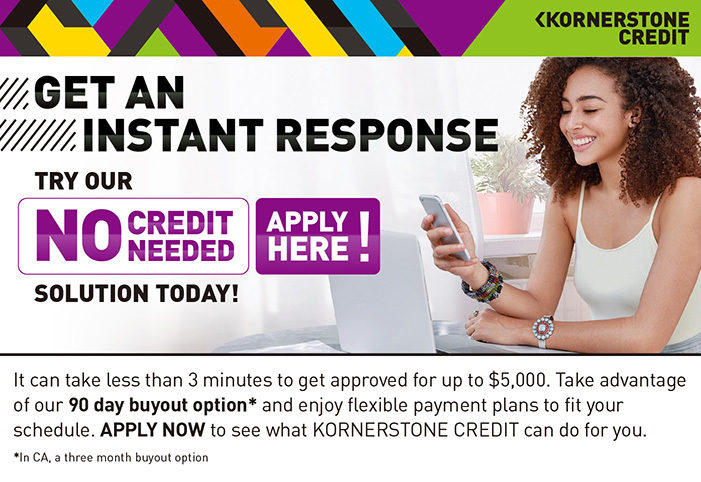 Kornerstone Credit - can be applied for online or in-store. Layaway - free in-house layaway (make payments & when its paid off you ride off). Low, Fixed Monthly Payments - Spread out the payments over 6-12 months. No Interest - No interest if paid in full. No Pre-Payment Penalty - You can pay off the loan at any time and pay no penalty! A Quick & Easy Application Process - The application process only takes about 5-10 minutes. You will need to bring a valid photo ID (driver's license), and a major credit card, along with any co-signer and social security information. Free in-house layaway. Make payments & when its paid off, you ride off.